You eat healthy, drink plenty of water and try to get outside to exercise a few times a week. What about your foot health? Let's face it, we are all on our feet a good portion of the day. If you are not wearing "healthy" shoes, then your body is suffering. Strive's Biomechanical Footbed Technology™ matches the unique contours of your feet to help improve posture and reduce harmful stresses. Incorporate the Java into your spring and summer wardrobe for whole body health. This is my first time trying a Strive pair of sandals and I'm so glad that I purchased them. I have never had a pair of sandals to fit so perfectly in addition to having extreme comfort. They fit as if they were custom made for my feet. I highly recommend this brand of shoes because of the exceptional quality. 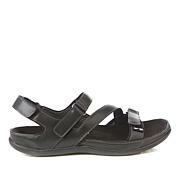 This is the most comfortable sandal I own. I put it on and I thought , "OMG", I finally found a sandal that fit my narrow foot! I followed the wear instructions I received in the box. I wore for 1 hour on day one and so on. The shoe never caused me any discomfort at all. 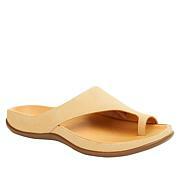 I like the fact that the sandal has a leather foot bed and the footbed helps my slightly flat feet. I write this review with so much satisfication. I decided to order another pair. I highly recommend. It's worth it! My feet and entire body feel heavenly when wearing these. I have plantar fasciitis, and the start of a sore "bunion" on R foot. I wear size 7.5M usually, 8 in Camuto and some other brands. I got the pewter in size 7.5/8. Fit is perfect. Heels, arches, toes all line up. I have orthotic inserts from a podiatrist for my athletic shoes, but these surpass. Soft leather that your soles can feel. I think the key to the awesome fit is the adjustable buckle. I wore short times to start. WOW.